Caleb's Coastal Life: Happy (belated) Earth Day! We have been having a great week in Fredericton. The show last night at the Playhouse was wonderful. David even gave a little shout out to Alan's new baby boy! But the real highlight of the week was the birth of Kathy and Roland's baby girl, Monica, born on April 20th. 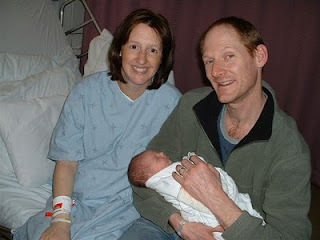 We were lucky enough to get to meet her on the day she was born. Caleb will have a life long friend in his new cousin. Kenyan proverb ... "Treat the earth well. It was not given to you by your parents; it was loaned to you by your children." Loving the pictures and sharing in your joy. Happy Belated Earth Day to Caleb and his mom and dad. What a wonderful PEZ picture! Caleb literally has "The whole world in his hands." Colleen and I enjoy seeing these beautiful photos. All the best to Caleb and his precious new cousin Monica.